A little-known fact about consumers is that their loyalty always goes to the brands that are capable of endorsing their promotional products with grace as if they can handle any situation and still follow a continuous path. Even if it can be a daunting task for entrepreneurs, specifically if you are new in this game and your rivals have decades or centuries of experience, you just have to think simply to live only in the marketing world. 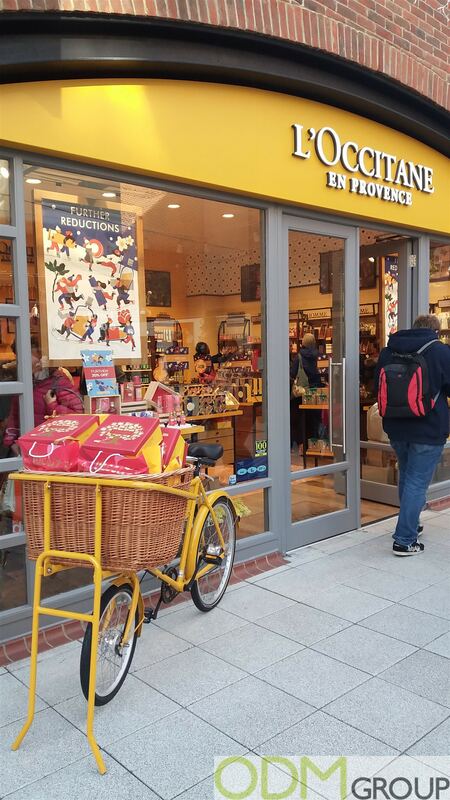 Take a leaf out of L’Occitane en Provence’s book to understand how profitable it is to make a bicycle POS display. From what is shown in the photo above, the brand parked the bike just right outside one of their stores in the United Kingdom. The factor that we admire about this marketing idea is that it does not look alienated at all. At this angle, it appears as a regular means of transportation, except for the metal stand and the oversized basket that they placed at the front to make it immovable. The advertising strategy is to keep the company’s signature colors; that’s why it does not look out of place near the display window. The logo has been printed on a plate attached to the body of the bike, yes, but we think it can do well with the promotion even without the brand name’s presence because of the black and mustard combination that the consumers know them for. If you compare it to a member of the female crowd, it is easily the type that only wears simple lip gloss, sandals, and dress but can still look beautiful. Another aspect that you may notice if you have been following L’Occitane for years is that they have not gotten rid of the woodsy touch. We are talking about the wooden basket that this brand fixed in front of the bicycle. It is a mark of this French company as well since their promotional merchandises consist of natural ingredients. This is an excellent feature as it allowed them to fill the carrier with custom shopping bags. The promo display in the UK is not the only one on the planet. 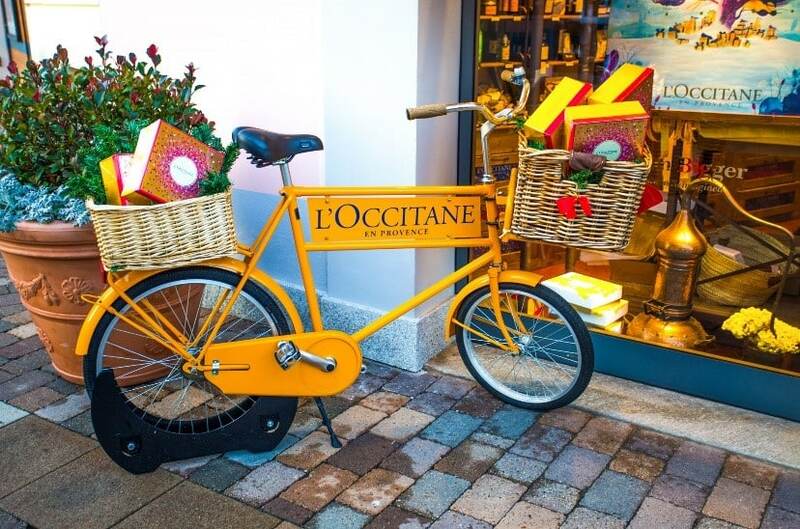 We have also found out that there is a similar bicycle situated close to L’Occitane’s shop in Manhattan. It has two smaller bins instead of one, and a contraption encases the tire at the back, so there is no need for the frontal support, but the main concept is the same. What benefits can the brand achieve from this bicycle POS display promotional strategy? Spot-on Brand Exposure. 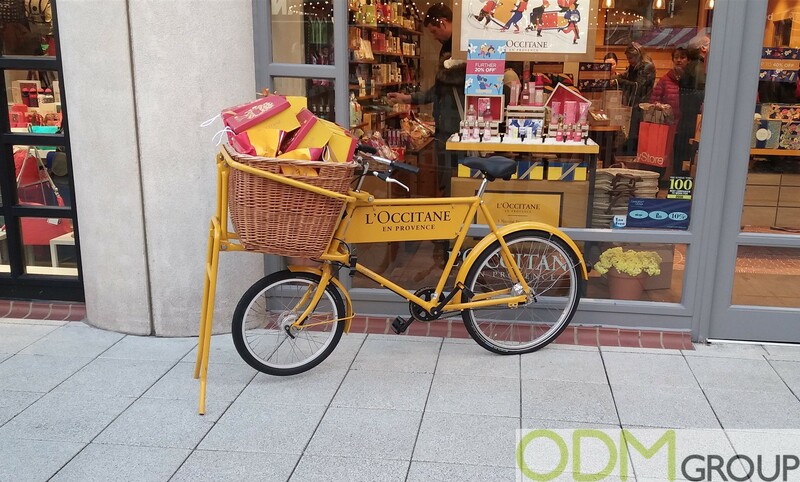 L’Occitane did not use a different logo on the bike; it is still the same one they have been marking their products with for years. This exposes the brand more to consumers. Active Customer Pull. Standees of celebrity endorsers are standard, but three-dimensional displays like the bicycle are not. Thus, it can encourage passersby to stop and check out the store it belongs to. Superior Brand Visibility. When a unique advertising ploy gets seen by those who are fond of social networking sites, they will want to pose with the POS display and post it on Facebook, Instagram, etc. Word can travel fast once it enters the web, and the viewers can potentially become clients after that. What other promotions had L’Occitane in the past? The brand has a bit of experience in managing a point-of-sale exhibition, even if not all of them have gone mainstream before. One of the displays that have caught our attention is a promotional stand that they placed by the door of their store in Rome, Italy. Its entrance is not too broad; that’s why the small stall looks just fine on top of a two-foot tall drawer. Like with the bicycle, the mustard paint covers most of the marketing display. What we like about it, though, is its simplicity and usefulness. The only design it has is the logo and the curves on the roof, but it does not look as if it requires further decorations. 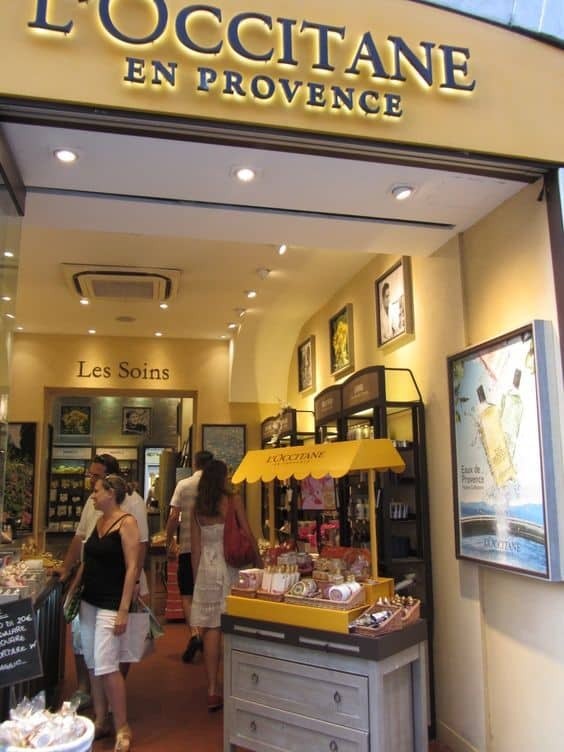 There are a lot of life-sized kiosks as well in the city, selling different kinds of products, and this mini version is not far from them as it contains the small L’Occitane items that consumers can bring to the check-out counter from the get-go. 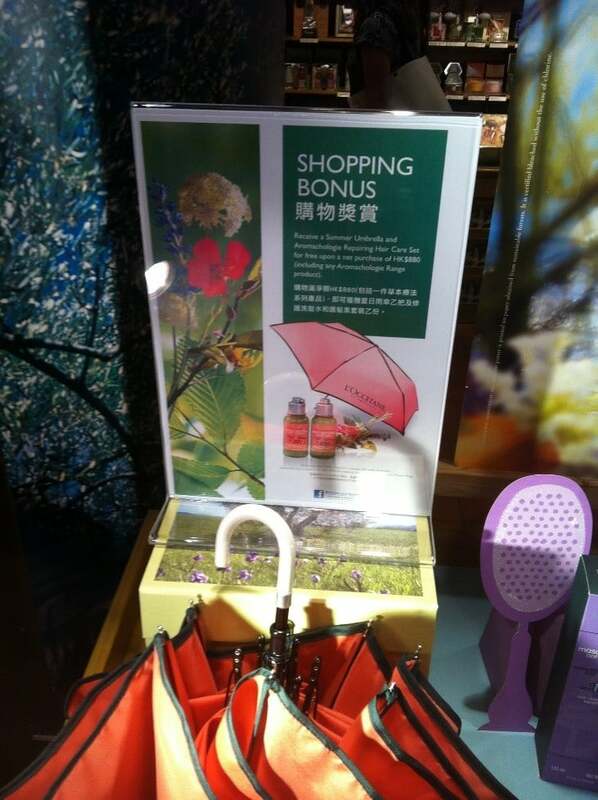 Lastly, the branded umbrella that adorned their shop in Hong Kong in 2011 was among the L’Occitane freebies that we talked about at length in one of our previous blogs. Its position and the words ‘Shopping Bonus’ on the print above it are very eye-catching. The ideas we have cited above proves that there are diverse ways to market a brand that you can try once in a while. Know your target demographic and where they live, that’s the first rule so that your POS displays can be as impressive as L’Occitane’s. Talk to ODM today to find more about beauty promos and POS marketing.